Hand made Pinch Pleat curtains hang beautifully and are undeniably elegant, but require a different kind of hook to those that are used with pencil pleat curtains. In fact, if you’ve never seen or hung pinch pleat curtains before, the prospect of stabbing a sharp hook into your brand new curtains can seem daunting and the whole task rather overwhelming. Lay the top of the curtain face down, on a clean,flat surface. 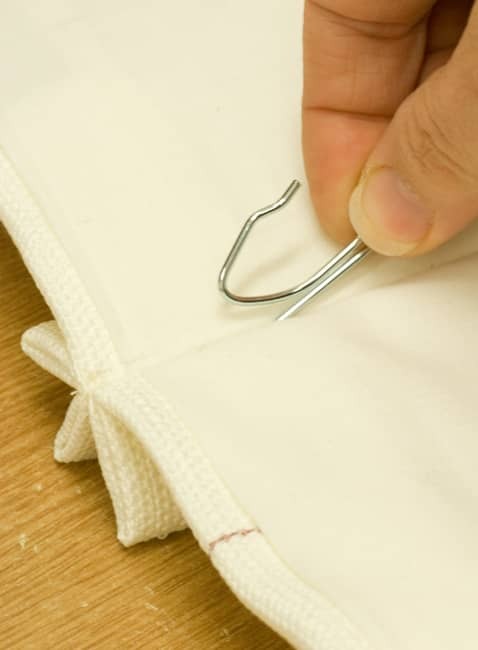 Then, with the lined side of the curtain facing you, slide the sharp point of the pin hook up and under the stitches in the back of the pleat until the point is hidden and only the hook end is visible. Make sure that the hook is as close to the top of the curtain as possible whilst still being hidden, so that the curtains can hang below the track or pole. This enables the curtains to concertina or stack back neatly. It is sensible to insert a few hooks, and then whilst supporting the rest of the curtain, hang the curtain from the pole or track to check that you are happy with the length. There is always a little room to adjust here in order to make sure the curtain is the right drop. Do bear in mind that the curtains may ‘drop’ by up to a centimetre when they’ve been hanging for a week or so, due to the weight of the curtain. When you are happy with the position of the hooks, it is a good idea to measure from the top of the curtain to the insertion point and make a small pencil mark on each pleat. This will ensure that the curtain hangs evenly and will prevent the annoyance of hooks popping out when hung. Insert a pin in every pleat, adding one pin to the outside edge of each curtain, and one to the inside edge of one curtain. The other edge should be left free so that it can overlap the other curtain, ensuring there is no gap between the two. Before you hang the curtains count how many pin hooks you have on the curtain and make sure you have the corresponding number of rings on your pole or runners on your track. 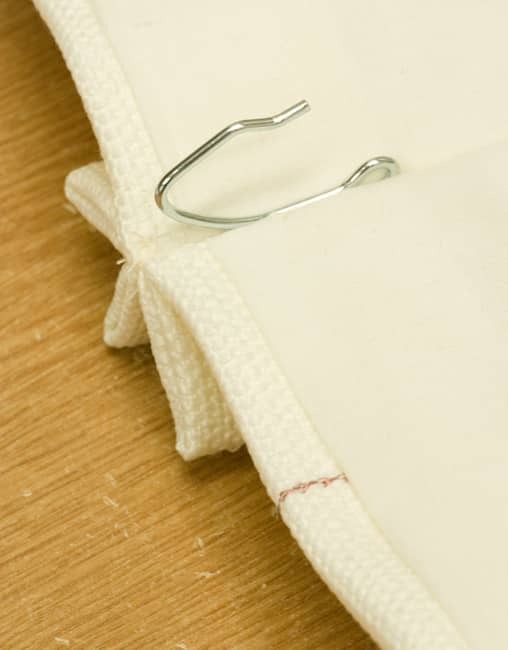 Supporting the curtain, each hook can then be inserted into the eye on the bottom of your curtain ring, starting from the middle, working outwards. This ensures that if you have the wrong number of hooks or rings, you can remove the extras without taking the whole curtain down again! Make sure you use the end stop or the last ring between the finial and bracket. Once the curtains are hanging, draw them back fully and then, from the top of the curtain, push the fabric back, in between the pinch pleats. Run your hand down the length of the curtain and press the pleats. For a truly beautiful finish, tie three strips of lining or fabric around each curtain. They should hold the folds in position but they should not be so tight that they leave indentation marks.Leave for 2 or 3 days then remove the ties and draw the curtains. They should then hang in the set folds. All of our made to measure curtain fabrics are available with a pinch pleat heading, please click here to view our range.